Some of the dogs at Orphans of the Storm® are energetic and eager to say hello to anyone and everyone, while others are a little more reserved and need a few minutes to warm up to new people. Either way, what all of them really want is a loving home to call their own. This week, I met both types! Mary the two-year-old Terrier mix is one of the dogs on the shy side. She seems a bit overwhelmed by the shelter environment and was sitting in the back of her kennel, rather than up at the front to sniff people as they walk by. But when she realized she was coming outside for a walk, she perked right up! Mary walked pretty well on the leash, though since she’s a little nervous she would sometimes stop and duck behind me if she saw or heard something. Mary may be shy, but that doesn’t stop her from being super snuggly! Whenever I knelt down next to her, she put her front paws in my lap and gave me a few little doggy kisses. When she wasn’t attempting to climb into my lap, she was leaning against my legs while I pet her and seemed to appreciate the fact that someone was giving her love and attention. 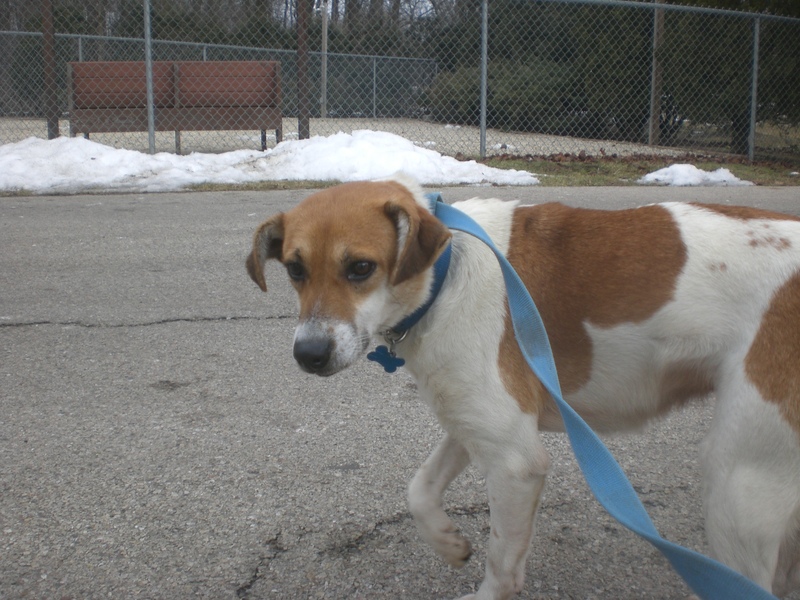 Stop by the shelter soon to see if Mary is the next cuddle-buddy for you! 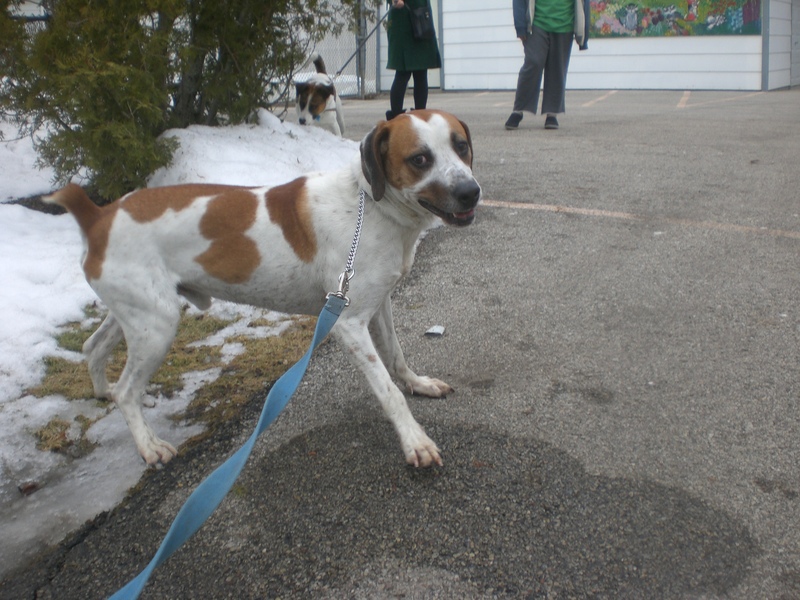 Jarvis the one-and-a-half-year-old Hound mix is as outgoing as they come. His short tail is constantly wagging and he’s happy to greet every person he sees. Jarvis has quickly become a volunteer favorite because of his great personality. Jarvis is just barely out of puppyhood, so he still has plenty of energy and would do best with a family that can keep him active and engaged. Jarvis, being a Hound mix, always wants to explore everything. We went dashing through the snow, stopping every few feet so Jarvis could sniff around. 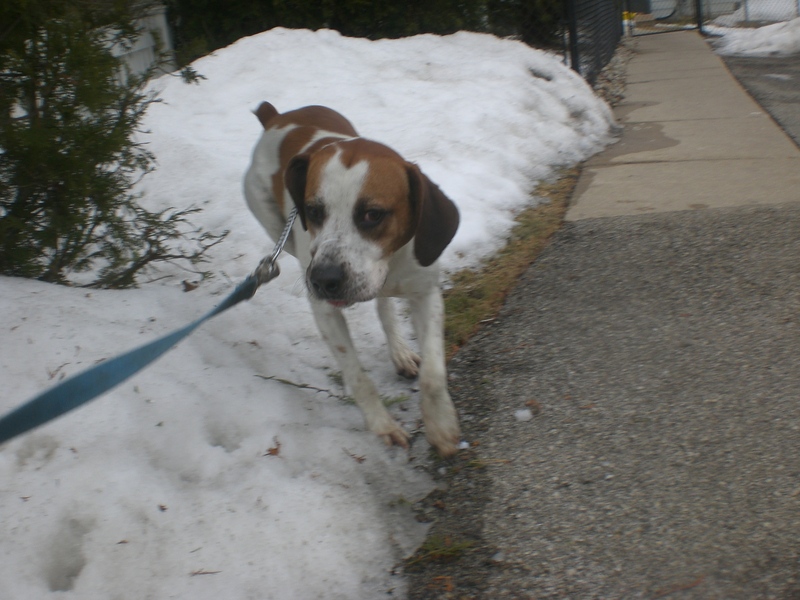 Jarvis would probably make a good running buddy for anyone looking for a new exercise partner in the new year. Jarvis is sure to bring a smile to your face with his exuberance. A happy-go-lucky pooch like Jarvis won’t stay at the shelter for long, so come in soon to see if Jarvis is the one for you! 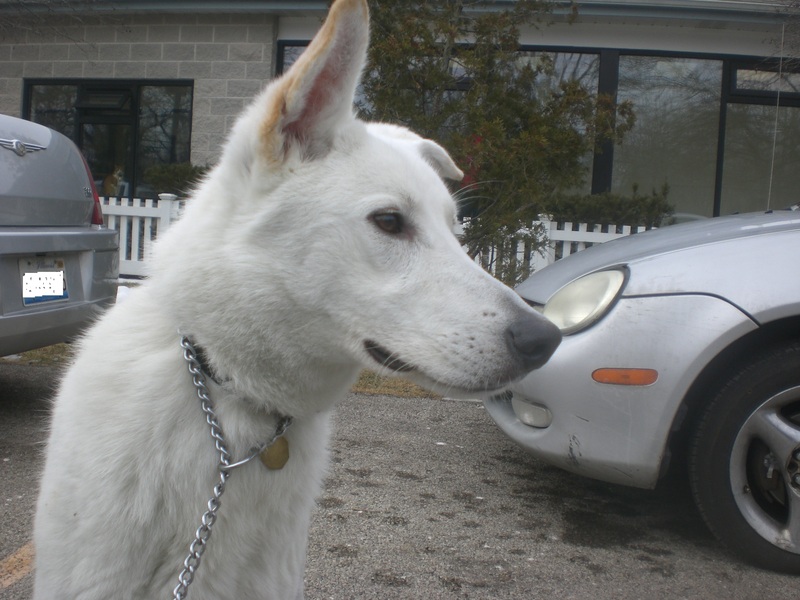 Cosmo the one-year-old Shepherd mix is an absolutely stunning all-white dog who, unfortunately, is extremely nervous at the shelter. I’ve been getting to know him over the last three weeks by sitting in the outdoor portion of his kennel with him, giving him plenty of treats and words of encouragement. I was thrilled that I could finally take him for a walk this week! 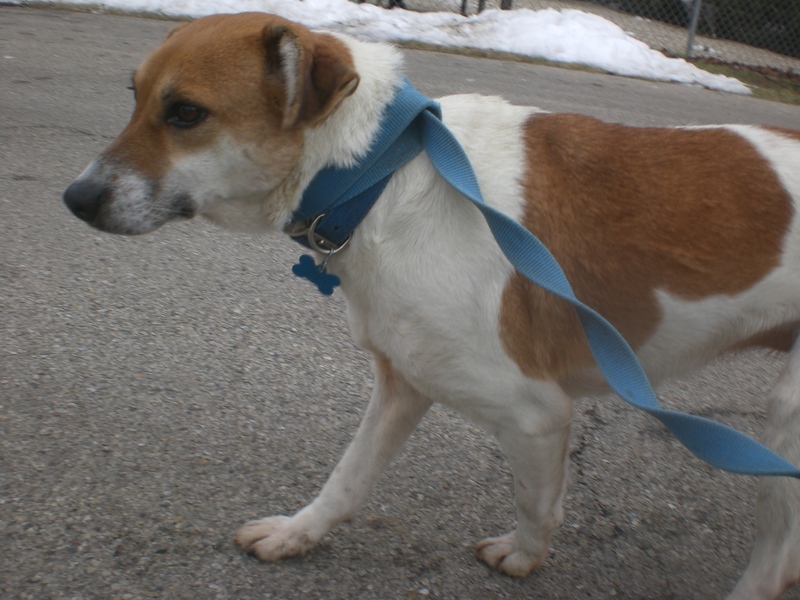 Since he’s still young and doesn’t appear to have had the best start in life, Cosmo doesn’t seem particularly comfortable with being on a leash–but the longer we were out together, the better he walked. Cosmo seems very food-oriented and will gently take treats from your hand, then lick your fingers to get the crumbs. He doesn’t mind being pet, especially if it’s nice and gentle. Cosmo just needs an owner who will take the time to build his trust and show him the world isn’t such a scary place. He has so much potential to be a wonderful, loyal companion. I plan on spending time with him every week as long as he’s at the shelter, and you should visit too to get to know Cosmo! I also saw Bella, Blush, Corky, Courage, Diamond, Ebbie, Lady, Lucky, and Topaz. 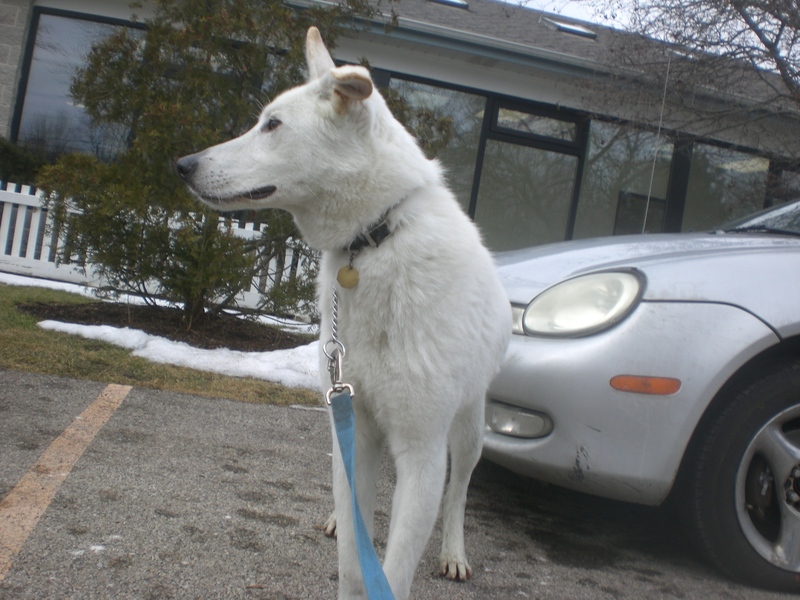 Posted by Meet the Pooches on January 29, 2015 in Dog Profiles and tagged adopt, animal shelter, animals, Chicago, dogs, Hound, Orphans of the Storm, pets, Shepherd, Terrier.